An even gentler version of our all natural aroma that insects hate - formulated just for kids and those with very sensitive skin. 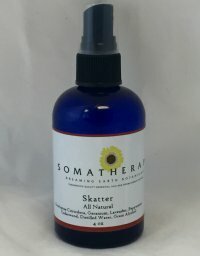 Skatter contains only our pure essential oils, a little grain alcohol (as a dispersant), organic soybean oil and distilled water. It's very effective, safe, gentle to the skin and smells nice too. Essential Oils of Eucalyptus Citriodora, Geranium, Lavender, Peppermint, Cedarwood Atlas. Note that the larger sizes (16oz up) are refill size and come with standard caps (no spray attachments).